We are pretty familiar with the destruction of Sodom and Gomorrah recorded in Genesis 18. Think about it, were the two cities destroyed because of the fullness of their sins or because the number of righteous was insufficient? Abraham interceded for the two cities, were the Lord to find 10 righteous within the two cities then, would history be different? We know the truth that the raging of sins could never overtake the grace of God. As people called by God’s name, are we willing to pay price to seriously intercede for our nation? Is the condition of our nation and her citizens not awaiting the intercession of Christians to our Heavenly Father? And the prayer of unity of the Malaysian Church? This year, the leaders of our churches have set June 2nd – 4th (Fri-Sun) as “A Day of Prayer for The Nation” calling all churches to set aside 24 hours to intercede for the nation. It would be good to arrange to start this 24-hour prayer time in a Service or end with a Service. We attached herewith the bilingual suggested Prayer Outline for a church service/prayer gathering received from Bishop Ong’s office for your use. Please educate, encourage and mobilise our members to take action to intercede for our nation. Will not the prayers being offered at such a time as this directly affect the future of our nation, the church and our future generations? 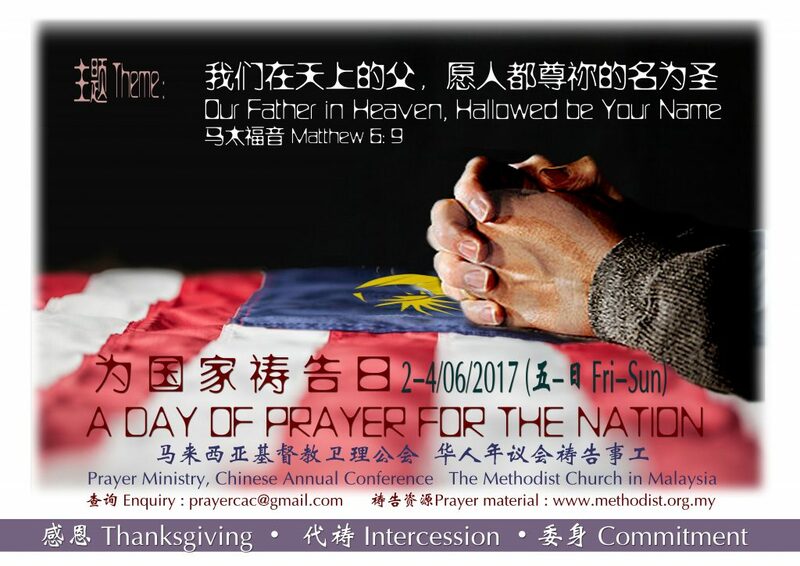 The poster for “A Day of Prayer for the Nation” has been printed for publicity. Kindly promote and mobilise. Thank you! May the knowledge of the glory of the Lord fill Malaysia as the waters cover the sea!